I feel as though I’ve almost written an entire review on this sunscreen already, but as the mentions are dotted about in different posts I thought I’d collate all of the information into one neat review. I wasn’t really that au fait with how ceramides worked (I think those dodgy shampoo ads from the nineties made me add the word “ceramide” to my list of beauty gimmicks to ignore!) but it seems that they are – quite literally – the thing holding our skin together. 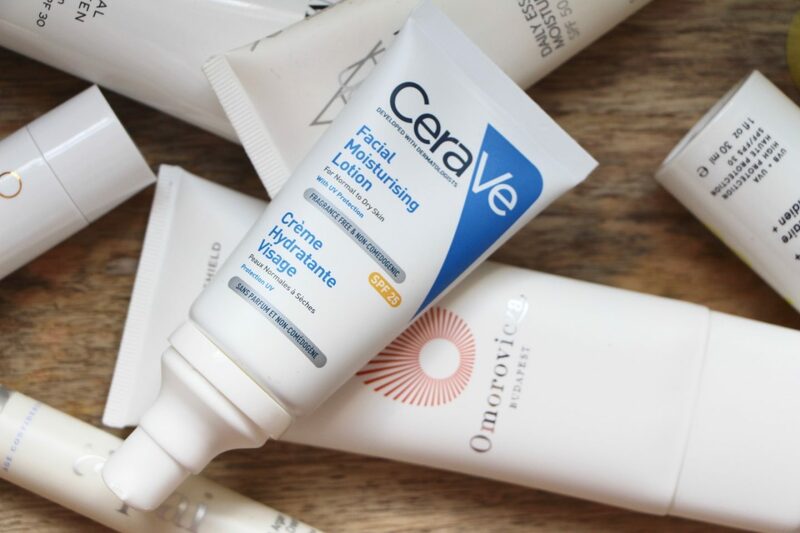 So the inclusion of essential ceramides in a well-formulated cream can’t be a bad idea – add in a shovel-load of niacinamide, which is also a marvellous ingredient for strengthening the skin’s barrier, and you have yourself a very attractive moisturiser. Especially if you have sensitive, itchy and irritable skin that constantly feels on the verge of a breakdown. And then there’s the broad spectrum sunscreen, protecting against UVA and UVB rays. All in a rather elegant lotion that’s hydrating but not greasy, lightweight but not alcohol-laden, doesn’t have added fragrance and comes in a sensible, easy-to-use pump-action tube. CeraVe say that this SPF 25 lotion is for normal to dry skin but I wonder whether oily or acne-prone skin might also benefit too. The niacinamide in the formula has skin-calming, sebum-regulating properties as well as being brilliant for helping with the skin’s barrier function, so perhaps a nice choice for those with angry, spotty skin that’s flaky and dehydrated at the same time. Has anyone with oily or spot-prone skin tried this? Please report back in the comments, I’d love to hear your feedback. For those wondering how the CeraVe lotion compares to my “test” SPF, Anthelios XL: I think that the CeraVe is more hydrating than the Anthelios and a better choice for drier skin or skin that’s in some way compromised or sensitive. If you want a more velvet, undetectable finish and a featherweight feel, Anthelios is the more appropriate option. 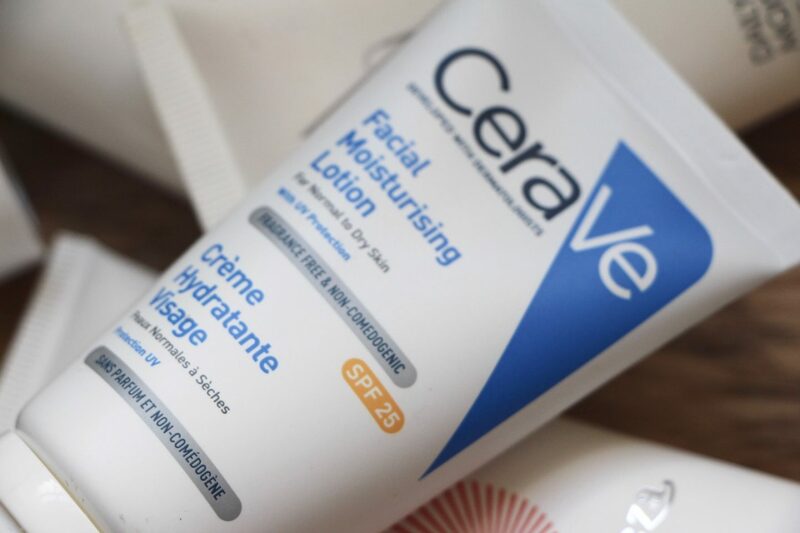 You can find CeraVe Facial Moisturising Lotion SPF 25 at Boots.com here* – it’s £12. Such a great review and I couldn’t agree more! I have oily, sensitive, acne-prone and irritated skin (lucky me huh). Anyways, I adore this Cerave moisturiser with SPF. It gives plenty of hydration without making me look greasy. It does however give quite the glow, but during winter who doesn’t want as much of a glow as possible? Sound like a lovely sunscreen! Thanks for the review. The fact it just says UV has put me off trying it. Does it protect you from UVA and UVB rays as far as you know? I think most people would find it a bit greasy. Perfection for me with my arid skin but definitely too much for greasy skin. However my daughter-in-law to be who has normal skin uses it too and loves it. Leaves me glowy but not shiny and works very well beneath my Max Factor Lasting Performance foundation. However Soltan seem to do a few formulations for each strength factor so possibly there is one to suit most people. I like that I have no reaction to the cream despite being hugely sensitive. I’m also impressed with Boots research into UVA ray protection which gave birth to the five star rating in the first place, a rating system that other sun screens use now too. Cerave really is such a great brand- I’m in love with their cleanser so I’m sure that their moisturizers are the same, they get the job done without a lot of fuss and it’s not super expensive either! Hi Ruth, Sounds great but I have a question. You say the fórmula includes niacinamide so…can I use my daily Vit C serum under it? I tried that one (a sample, stolen from a friend) on my combination oily skin and it felt like too much. I hope we can get this in Australia soon. I spy the omorovicza in the background. I was really interesting in trying it. How do you find it? Ah! If only they made an SPF 50 version! Sadly my skin is too pigmentated through previous years of reduced protection (or no protection!!) sunscreen to risk dropping as low as 25. Maybe during the winter months? Love the Cerave brand. I’ve used their SPF moisturizer for oily skin and it worked really well, so your positive review doesn’t come as a surprise to me. I’m currently loving inDefense30 from Indeed Labs as my go to SPF moisturizer.